[139 Pages Report] The rising demand for Artificial Intelligence (AI)-based solutions and platforms, and the need to analyze large and complex data sets are expected to drive the growth of the enterprise AI market. 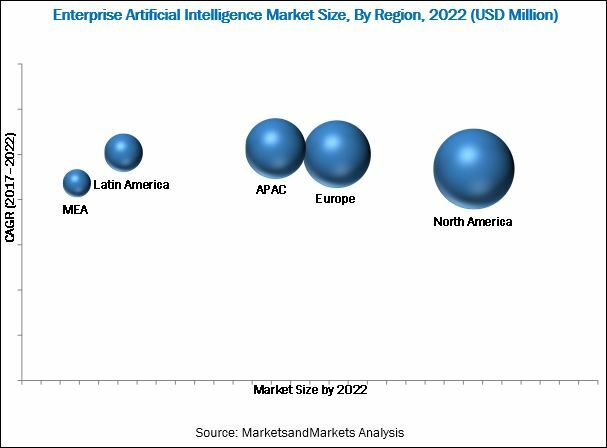 MarketsandMarkets expects the global enterprise AI market to grow from USD 625.0 Million in 2016 to USD 6,141.5 Million by 2022, at a Compound Annual Growth Rate (CAGR) of 48.7% during the forecast period. The base year considered for the study is 2016 and the forecast period is 2017–2022. The objective of the report is to define, describe, and forecast the size of the enterprise AI market on the basis of components, technologies, services, application areas, deployment type, organization sizes, industries, and regions. The report also aims at providing detailed information about the major factors influencing the growth of the enterprise AI market (drivers, restraints, opportunities, and challenges). The enterprise AI market includes various enterprise AI vendors, such as IBM (US), Microsoft (US), AWS (US), Intel (US), Google (US), SAP (Germany), Sentient Technologies (US), Oracle (US), HPE (US), and Wipro (India). 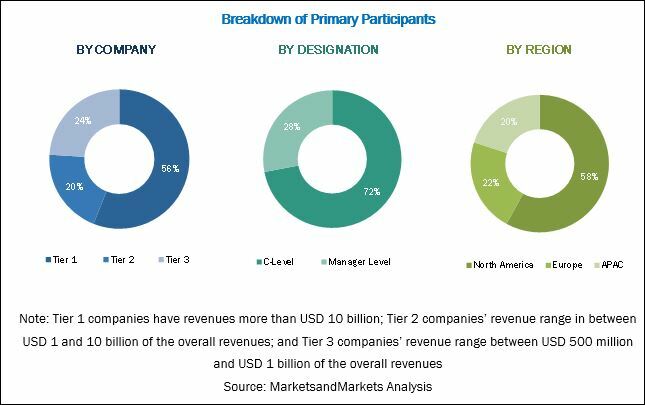 MarketsandMarkets expects the global enterprise Artificial Intelligence (AI) market to grow from USD 845.4 Million in 2017 to USD 6,141.5 Million by 2022, at a Compound Annual Growth Rate (CAGR) of 48.7% during the forecast period. The rising demand for AI-based solutions and platforms, and the need to analyze large and complex data sets are expected to drive the growth of the enterprise AI market. The component segment has been further segmented into solution and services. The services segment is expected to grow at a higher CAGR during the forecast period. The services in the enterprise AI market play a vital role in the efficient and effective functioning of Natural Language Processing (NLP) and machine learning applications. Services are required to effectively integrate AI technologies with business modules and link them with the existing working environment. Among technologies, the NLP segment is expected to grow at a higher CAGR during the forecast period. Due to the growing use of personal devices and smartphones, and the rising rate of internet usage, the need for human-to-machine level interaction has increased significantly in enterprises. With the growing demand for Machine-to-Machine (M2M) translation, the use of NLP is expected to grow. Many enterprises are deploying AI solutions to gain benefits from them. The enterprise AI market is also segmented on the basis of application areas. The analytics application segment is expected to have the largest market size during the forecast period. The analytics application is a data discovery application that reviews information with the help of AI to save time for decision-making. AI is proving to be a very supportive tool for aligning an enterprise’s business objectives with the AI technologies supporting those objectives. Among services, the managed services segment is expected to grow at a higher CAGR during the forecast period. Managed services are extremely substantial, as they are directly linked to delivering the best customer experience. As every business is dependent on its customers and cannot afford negotiations on this aspect, enterprises opt for managed services. These services provide the required technical skills and expertise for maintaining the deployed solutions and keeping them up to date. On the basis of deployment type, the cloud deployment type is expected to grow at a higher CAGR during the forecast period. This deployment type is simple and cost-effective for use in applications, such as customer analytics, virtual assistance, and self-diagnostics. North America is expected to have the largest market size in the enterprise AI market, while Asia Pacific (APAC) is projected to grow at the highest CAGR during the forecast period. The North American region has shown increased investments in the enterprise AI market, and several vendors have evolved to cater to the rapidly growing market. A considerable growth is expected in the region during the forecast period. In North America, the enterprise AI technology is effectively used for various business applications, such as security and risk management, marketing management, customer support and experience, and process automation. The enterprise AI market faces many challenges; for instance, incompatibility concerns and lack of skilled employees to use AI in enterprises. The major vendors that offer enterprise AI solutions across the globe include IBM (US), Microsoft (US), AWS (US), Intel (US), Google (US), SAP (Germany), Sentient Technologies (US), Oracle (US), HPE (US), and Wipro (India). These vendors have adopted different types of organic and inorganic growth strategies, such as new product launches, partnerships and collaborations, and mergers and acquisitions, to expand their presence in the enterprise AI market.